To order, choose the maximum number of SIMULTANEOUS CALLS (SC) you need coverage for from the drop down menu on the right. Number of SC is half when using in G.729. Evolve your communications with 3CX Phone System for Windows - an IP Phone System that completely replaces your proprietary PBX, supports standard SIP soft/hard phones, VOIP services and traditional PSTN phone lines. 3CX Phone System is far less expensive than a traditional PBX and can reduce call costs substantially by using a VOIP service provider. Its web-based administration makes phone system management easy. 3CX Phone System eliminates the phone wiring network and allows users to easily work remotely. 3CX Phone System runs on any Windows or Mac O/S Server or computer. 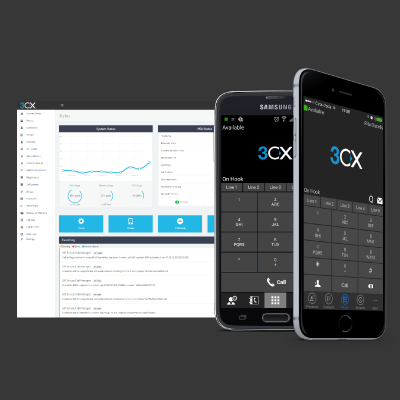 The 3CX Professional Edition comes as a license key upgrade to 3CX Phone System. Simply reactivate your 3CX Phone System and bring to life call center features. Out of the box configuration for many VOIP providers, VoIP Gateways, Skype and IP Phones.